I caught this in Yusuhara town during golden week. Do you know kawamutsu? It is seen in narrow waterways , a lot of rivers. 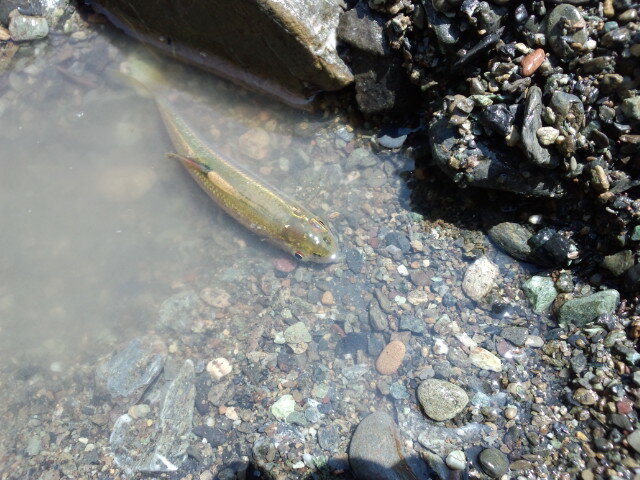 In early summer, we watch the fish change color. Its scientific name　is Nipponcypris temminckil. It is a member ofCypriniformes（called “koi” in japan). It is called Dark chub in English. Kawamutsu is major river fish in Japan. Its size is 10-15cm and is found in many rivers. It lives in West Japan and East Japan. During breeding season, Kawamutsu’s body change breeding color. Male kawamutsu change into red color, in body, shallow water spawn.They eat aquatic insects, crustacean, small fish, and algea. Kawamutsu is omnivorous. Kawamutsu called one of species “Haya” staple Ugui, and Oikawa . “Haya” origin Japanese word “Hayai” In Japan, people eat “Kanroni”,”Karaage” and so on. Kawamutsu is seen a lot of river and narrow waterways. So we can watch near Kochi University.During the recent Golden Week holiday, I went to Yusuhara town. Yusuhara town have river source of Shimanto river. It very beautiful. It is important to protect river and preserve the animal ecology.